Saturday – We did a lot of running around to get things done. We went to the storage unit to clean out some more items. We made a run to Goodwill, but they were closed. So we went to ARC and donated a lot of stuff. We ate lunch at Dickey’s BBQ and settled in for the afternoon. Bob took a nap and I worked on more of the pictures that I am trying to sort, trash duplicates and put them in baggies with labels and get them ready to be mailed to a place which will digitalize them. We sat out at social hour.We had a quiet dinner at home. Sunday- More time getting things done. It was a cold day, so we did a lot in the MH, including laundry. We took a nice nap and went to Texas Roadhouse for dinner. Marianna came over to see the dogs. She is taking care of them for us which is awesome. One less thing to worry about over the next two days. Monday- We were up early as Bob had to be at Lutheran Hospital at 6:30. When we arrived, he was taken right back to the pre-op area. After about 45 minutes,they came to take me back. I was there when the Anesthesiologist came in. Just before he arrived I realized that Bob had the nausea medicine given right before he had the neurological issues last year. So I told the Anesthesiologist that. He decided that it was the Compazine, so he decided that he would not give him that this year. Once Bob was off to the OR, I returned to the waiting room for about 1/2 an hour. Then I left to go to my Ophthalmologist appointment. I had tried to change the appointment, but they did not have another date available. So we decided since I would be just sitting around anyway, that I should go. The nurse had my phone number and knew where I was going. I had a good appointment and am going to have my right eye cataract removed in 2018, when Medicare kicks in. I stopped at Panera for a salad on the way back to the hospital. I parked and ate the salad in the little area downstairs before returning to the waiting room. By this time it was almost 1 PM. I read my book. At around three there started to be a very loud noise. It sounded like rain on the MH roof, but I was on the third floor and the building had five floors. 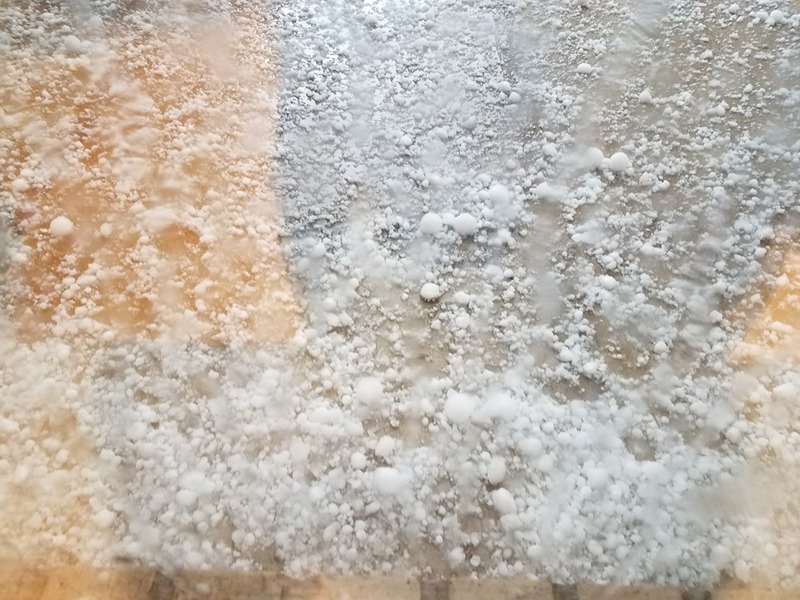 Someone said it was hail, so I went out to look out the window near the elevators. Oh boy! Was it hail! The size of tennis balls. Everyone was saying there goes the windshields on the cars! People actually left to go look at their cars when it was still hailing! Not me, I thought there was no point in going out. There was nothing that I could do, plus who needs a concussion! I took pictures, then quickly moved away from the windows at the hail was hitting the window and I was afraid it was going to break. That window did not, but others in the hospital did. In watching TV, back in the waiting room, they were saying that the area around the hospital was the hardest hit by the largest hail. Once the hail stopped, I went out to the car to check on it. We did not have any really apparent damage, but all the cars around me had lost either their windshield or their back window. I went back to the waiting room and waited. The Doc had said 5-6 hours, it was almost 8. I spent a long time talking to MaryAnne on the phone. I had also called Marianna, to check on the MH. The weather was not as bad at the MH, and the only damage was to some folks whose roof vent covers cracked or flew off in the wind. We have covers, over our covers, so that we can keep the vents open in the rain, so we did not have any apparent damage. At 5, the staff turned off the lights in the office, locked their door and went home. I was the only person still waiting! Eventually, the Anesthesiologist came by to say that they were done and that Bob was awake. He said that he had no neurological issues this time. I had to wait another 1/2 hour before they came to take me back to see Bob. I watched the nurse do another neuro check which was 100%! I was sure glad that his tongue went straight out instead of at a 90 degree angle like last year! He started having a little bit of nausea, even with all the stuff that they had given him. 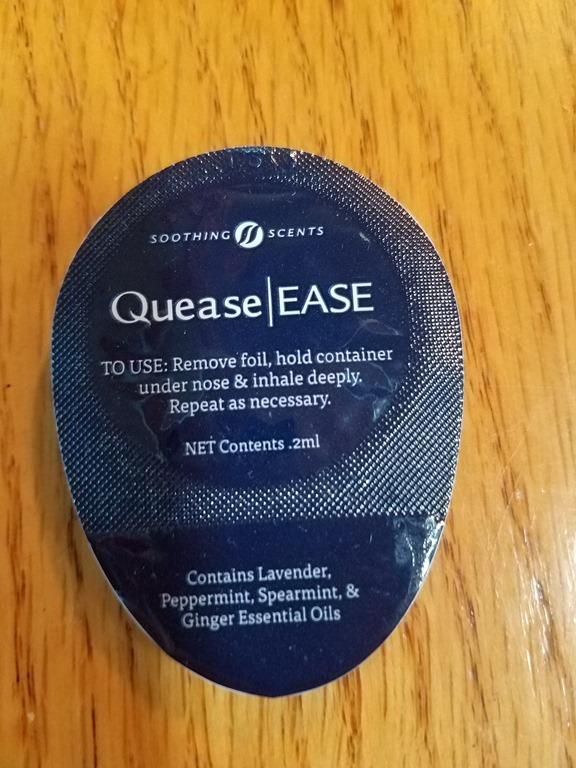 So the nurse bought some Quease EASE. I have not been a real believer in the Essential Oil craze that is going around, but this stuff really worked! It contains Lavender, Peppermint, Spearmint and Ginger essential oil. I would put it under Bob’s nose and he would take 4 sniffs and the nausea would go away. Amazing! I had to do this several times. We were eventually transferred to the cardiac floor. He had terrific nurses in the PACU and on the floor. I stayed with him and fed him supper. He was able to eat, but since he had to stay flat until 9 PM, it was hard for him to eat. I left around 8:45 and went home to happy dogs. The dogs laid in my lap until I went to bed. Tuesday- Bob texted me and asked for coffee and to let me know that he would be ready for discharge in about an hour. I walked the dogs, ate breakfast, and went out to the car. The sun was shining and now I could see the damage to the car. On the passenger side, the window was cracked. We also have a lot of dents. I arrived at the hospital and Bob was sitting up. The Nurse Practitioner had been in and took out the stitch. The nurse did one more neuro check, then Bob dressed and we headed home. He took a nice long nap, as he had not gotten a lot of sleep in the hospital. I joined him as I was still exhausted from yesterdays stress. We had a quiet dinner at home. Wednesday- We had a quiet day with Bob resting. Since the surgery was so long, and he was under the anesthesia for so long, his brain was foggy. It will be slowly clearing over the next few days. He has to be really careful, as both dogs want to be on his lap and we do not want the area in his groin to open up. He is really bruised! I have been walking the dogs, but Bob went for one of the walks with me, just to get some fresh air. He cannot bend over yet, so he can’t pick up after the dogs. I called the insurance company about the car. I told the gal, “ We are in Denver, need I say more? “ She said, “hail?”… We are going to have the repair done in Indiana. We went to social hour at the small pavilion in the afternoon and ate dinner at home. Thursday- Another quiet day. Bob walked the dogs a bit more. He seems to be doing very well. His brain is less foggy and he is able to walk longer distances. He even took the dogs out for their last grass visit at 10 PM. I keep working on the pictures. Friday- More of the same as yesterday.